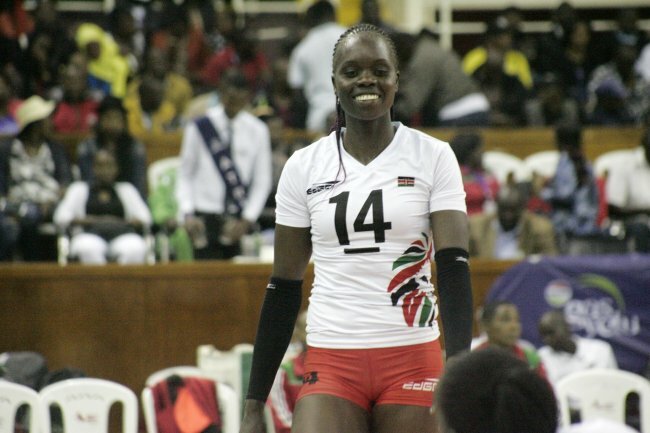 Kenya completed their pool matches unbeaten following a 3-0 win (25-17, 25-21, 25-16) over Tunisia at Palais des Sports Hall in Yaoundé, Cameroon on Tuesday. This result in the 2017 Women's African Nations Championship saw Malkia Strikers finish top of Pool A after winning all their four matches. They will face Egypt in the semi-final. Egypt clinched the third semifinal ticket in Pool B after Cameroon had earlier topped the pool to book their places in the final four after they beat Botswana 3-0 (25-14, 25-18, 25-21). Cameroon will battle it out with Tunisia in the other semifinal match. Mercy Moim scored 13 and Jihen Mohamed had 14 for Tunisia. In this match, Kenya dictated the pace from the onset giving the North Africans little chance to score points. Tunisia found it hard to penetrate the Kenyan block of the centers Edith Wisa and Brackcides Khadambi. Moim did well at serving and in defence while being extremely effective in attack. The score stood at 4-1 for the Kenyans– that was only the start of the match, with the first technical time-out following at 8-5 for the home side. At the second break, Malkia Strikers surged further ahead 16-8. The flow of the game remained the same in the other sets as well, even after the home coaching staff started to use players from the bench. The second game started slowly before Kenya pulled ahead 15-12. This margin remained through to the twenties when Kenya surged ahead before bagging the set. The third set started well for Tunisia who took a two point lead at the first TTO. But on resumption, Munala made changes which turned the tide. They pulled it back to 13-11 and even led 20-15. From here Kenya did not look back. Two consecutive hard spikes from Triza Atuka and Khadambi secured the third set. After the match Munala said: “I am satisfied with the overall result of the group stage, and with today’s chance to see almost all of our players on court. And now we are all waiting for the semifinal. Moim said: "Tunisia are a very good team and never give up. It is always very interesting to play against them. I am happy that we made this group finish in the best possible way. Now we expect another tough match in the semis."